Movie Review: "Beasts of the Southern Wild." | Movies | Style Weekly - Richmond, VA local news, arts, and events. Movie Review: "Beasts of the Southern Wild." A child's imagination floods this sometimes confounding film. Tiny Quvenzhané Wallis delivers a compelling, if confounding, performance as 6-year-old refugee Hushpuppy. Stories about poor people are rare at the movies, especially those told from their point of view. "Beasts of the Southern Wild" is rarer still: a movie about the poor unfolding almost entirely from a child's perspective, determined to convey the world the way a child might see it. That determination results in a film that is both audacious and at times difficult to follow. The result is a surprisingly inventive low-budget film, where the trade-off is occasional lapses of logic and coherence. The closer you get to a child's point of view, the fuzzier that view becomes. 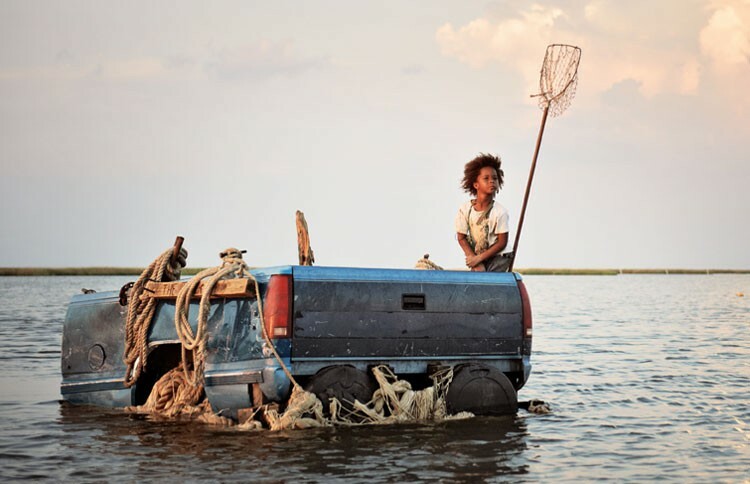 The child's name is Hushpuppy, memorably performed by newcomer Quvenzhané Wallis, who wanders around a junk pile she calls home while narrating her life with her father, Wink (Dwight Henry, delivering another outstanding performance for an amateur actor). Wink is a heavy drinker whose wife, Hushpuppy's mother, has either run off or died. Hushpuppy and Wink live off the land in a Louisiana-bayou-type region called the Bathtub, apparently because it is below sea level and cut off from the rest of society by a large levee. Although the flow of time in the film is not always linear, at some point a tremendous storm floods the land. Luckily Wink has built his shack to function like a miniature ark, rising with the water. Eventually a large group of main characters who've braved the storm meet in a floating shanty town. From Hushpuppy's point of view it's just another weird episode in her erratic life — until the authorities arrive. "Beasts" has been interpreted by some as an allegory for the Katrina disaster, but the flood and its aftermath constitute only part of the film. Also important is Hushpuppy and Wink's everyday life, both before and after the flood. They scoop bushels of squirming crustaceans out of the water for dinner, raise livestock and make their own liquor — strange doings for most of us, living in large cities and suburbs as far from a live crawdad as one can get. These images of an alien existence are especially interesting filtered through the mind of Hushpuppy, and form the core of what one might deem the film's philosophy: that these poor people are rich in freedom. It's doubtful you've lived anything close to this type of life, but likely you will recognize the way Hushpuppy experiences it, in a hopscotch of memory, imagination and distorted perspective. When you combine the outright squalor of the life strewn before those eyes, things get very weird. It can be difficult to tell what's real, what Hushpuppy is merely imagining and what is a combination of the two. Her father, for example, has some sort of illness. But is his heart ailing, the way Hushpuppy interprets his fainting spells, or is he passing out drunk? Or is it something else altogether? Does her neighbor (Gina Montana) really give her a homemade potion to stuff in his mouth when he falls unconscious? It's difficult to say, and sometimes difficult to discern not only if Hushpuppy's mental wanderings are real, but what their point is. "Beasts of the Southern Wild" is more a series of impressions than a linear story. Sometimes those impressions make complete sense, as when Hushpuppy performs a willful act of destruction to gain her father's attention. Sometimes they are tantalizingly vague, as when she meets someone who might or might not be a much-desired relative. Sometimes they are dubious. For example, Hushpuppy swims far out to sea to hitch a boat ride before visiting the possible relative. She spouts proverbs, far too frequently — not to mention cryptically — for a tyke, like she's the Oracle of the Bayou. Then again, maybe the film is an allegory, or a fable, full of strange beasts and signs.